The most commonly attested form of rising time scheme is one in which culminating points at or behind Ziqpu Stars are given either for the beginning and end of a sign of the zodiac or for the end of each twelfth of a sign of the zodiac (known as a microzodiac sign). 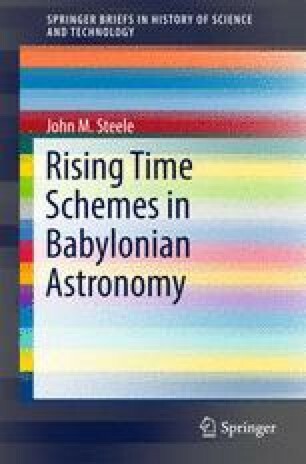 This chapter studies the texts containing zodiac-based rising time schemes showing that they all attest to the same basic scheme. Furthermore, it is demonstrated that this scheme is identical to the calendar-based scheme, and that the calendar-based scheme was probably the earlier of the two schemes.